Scholar's Mate – Black is checkmated. The same mating pattern may be reached by various move orders. For example, White might play 2.Qh5, or Black might play 2...Bc5. In all variations, the basic idea is the same: the queen and bishop combine in a simple mating attack on f7 (or f2 if Black is performing the mate). Unlike Fool's Mate, which rarely occurs at any level, games ending in Scholar's Mate are quite common among beginners. It is not difficult to parry, however. After 1.e4, Black can play a semi-open defense instead of 1...e5. Openings such as the French Defense (1...e6) or the Scandinavian Defense (1...d5) render Scholar's Mate unviable, while other openings such as the Sicilian Defense (1...c5) make 2.Bc4 a bad move (1.e4 c5 2.Bc4? e6, intending ...d5, gaining time by attacking the c4-bishop and attaining easy equality). The most common response to the Bishop's Opening (1.e4 e5 2.Bc4) is 2...Nf6 (see Bishop's Opening, Berlin Defense), which also renders Scholar's Mate unviable. After 1.e4 e5 2.Bc4 Nc6 3.Qh5 g6 4.Qf3 Nf6, Black has successfully defended against Scholar's Mate. After 1.e4 e5 2.Bc4 Nc6 3.Qh5, the cleanest way to defend against the mate threat is 3...g6. Should White renew the Qxf7 threat with 4.Qf3, Black can easily defend by 4...Nf6 (see diagram), and develop the f8-bishop later via fianchetto (...Bg7). After 1.e4 e5 2.Bc4 Bc5 3.Qh5, Black stops Scholar's Mate with 3...Qe7! If Black played 2...Bc5 instead of 2...Nc6, then 3...g6?? is a blunder because it doesn't defend the e5-pawn (Black loses the king rook to 4.Qxe5+ followed by 5.Qxh8). The best move is 3...Qe7! (see diagram), protecting both the f7- and e5-pawns; and now Black threatens 4...Nf6, gaining a tempo by attacking White's queen. Play might continue 4.Nf3 (attacking the e5-pawn a second time) 4...Nc6 5.Ng5 Nh6, when White has no way to keep up the pressure and will soon have to pull his exposed pieces back. Although a quick mate on f7 is almost never seen in play above beginner level, the basic idea underlying it—that f7 and f2, squares defended only by the kings, are weak and therefore good targets for early attack—is the motivating principle behind a number of chess openings. After 1.e4 e5 2.Nf3 Nc6 3.Bc4 Nf6 (the Two Knights Defense), White's most popular continuation is 4.Ng5 attacking f7, which is awkward for Black to defend. The Fried Liver Attack even involves a sacrifice of the knight on f7. In the Frankenstein–Dracula Variation of the Vienna Game (1.e4 e5 2.Nc3 Nf6 3.Bc4 Nxe4), threatening Scholar's Mate with 4.Qh5 is the only way for White to play for an advantage. Danvers Opening (1.e4 e5 2.Qh5) and the Napoleon Opening (1.e4 e5 2.Qf3) are both aimed at threatening Scholar's Mate on the next move (3.Bc4). Although the Napoleon Opening is never seen in high-level competition, Danvers Opening has occasionally been tried in tournaments by GM Hikaru Nakamura to achieve a practical middlegame position for White. Scholar's Mate has sometimes also been given other names in English, such as Schoolboy's Mate (which in modern English perhaps better connotes the sense of 'novice' intended by the word Scholar's) and Blitzkrieg (German for "lightning war"), meaning a quick and short engagement (Kidder 1960). ^ Kállai, Gábor (1997). 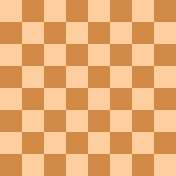 Basic Chess Openings. Everyman Chess. p. 7. ISBN 978-1-85744-113-0. Hooper, David; Whyld, Kenneth (1996) [First pub. 1992]. The Oxford Companion to Chess (2nd ed.). Oxford University Press. ISBN 0-19-280049-3. This page was last edited on 13 March 2019, at 05:14 (UTC).